I'm a big supporter of smaller companies with an obvious dedication to happier, healthier pets, and I believe that Sojos is just such a company. When I found out they had released a new, single-ingredient treat I knew that we had to try some! There really isn't anything not to love about these Simply Meat freeze-dried treats. They are exactly what they say there are: nothing but morsels of raw, freeze-dried turkey, beef or lamb in cheery, resealable packaging. Since they are all natural, the treats are an assortment of sizes which make them perfect for my multi-dog household. When I grab a handful for training, I can give the larger pieces to Boca and the smaller ones to Ruby. The girls both went bonkers for these, and they are perfect for working on new behaviors since they are without a doubt a high-value treat. I can feel good about feeding the Simply Meat treats knowing that they are nutritious and all-natural. They would be great for dogs with food sensitivities, too, since there are no guessing games with their ingredients. These will surely be a staple at my house. DISCLAIMER: I was provided Simply Meat treats from Sojos in exchange for my honest review. All opinions expressed are my own and I only publish reviews for a products I feel comfortable using in the day to day life of my pets. I love Sojos (it doesn't hurt that we sell them where I work) they're a great brand that makes really yummy treats that are great for training and just a quick bite every now and then. I'm glad the girls like them! Good to know--I'm so lazy these days; I just keep buying the same old things. 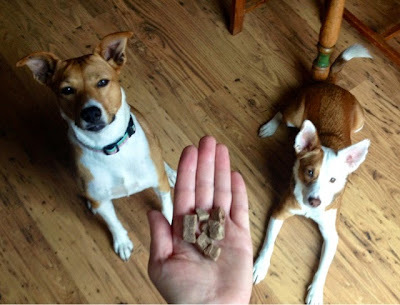 Those look a little smaller and easier to manage than some of our other freeze dried turkey treats. How crumbly are they? I like freeze dried treats but there's always a bunch of crumbs at the bottom. These are quite firm and I don't find them crumbly at all. Not like, say, the Stella & Chewy's patties or the freeze dried liver bits. The Sojos are actual chunks of meat. They have Sojos here - but not all the different kinds of treats so it makes it a little frustrating to have such limited choices. Maybe they will start selling those here soon too! I'd love to try these for Cairo. I'll have to see if my local store carries them. She is very picky about treats but loves freeze dried cow lung. It sounds gross but they're made in the USA and my vet approved of them. Bain would drool over these. We have been using the Purebites treats, but would love to try these out. Such a simple, nutritious treat! I’ve been buying your Sojos Simply Turkey Dog Treats for my dogs for a while as it was a one ingredient treat and I opt for healthy treats for my pooches. They loved this treat and was doing very well on it until the MOST RECENT BAG. Both my pooches ended up with FOOD POISONING from this bag– they alternated vomiting and diarrhea throughout the night, I did not sleep much that evening. My two dogs diarrhead every two hours (pure liquid) and vomited about 6 times each throughout the night both in discomfort and pain. I rushed them to the vet the following day where they were both treated immediately (not to mention a big fat bill of $1,000). I am so happy they have both recovered now but from this experience I will never buy Sojos again. Hi MissApril, I am sorry to hear this and I encourage you to let Sojo's know directly. I am not affiliated with them beyond this product review.